It's December 2nd!! 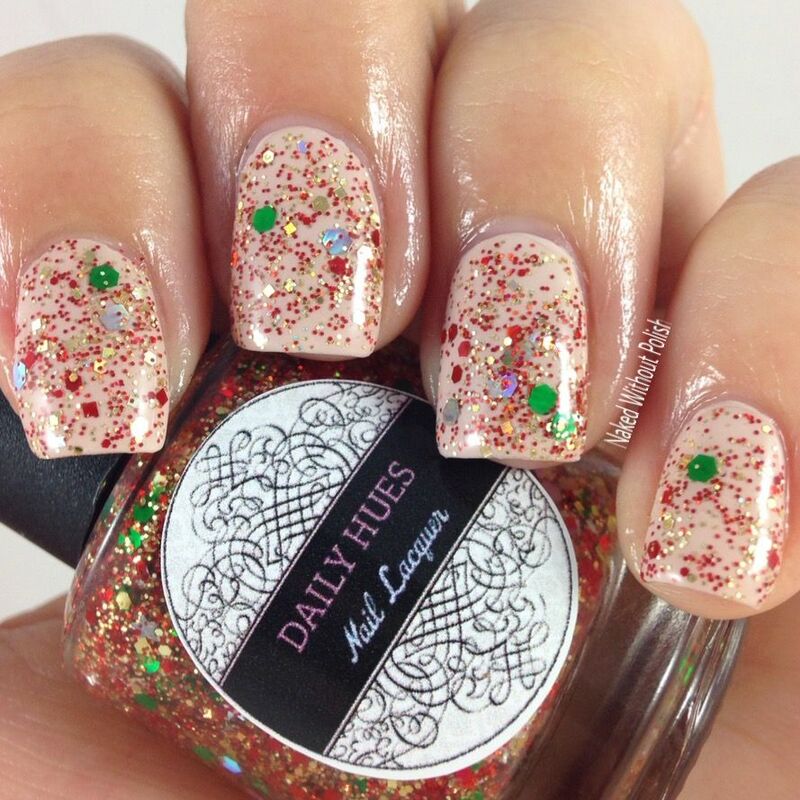 I've got the lovely Create Christmas Collection from Daily Hues Nail Lacquer to show you all today. This collection is super special. 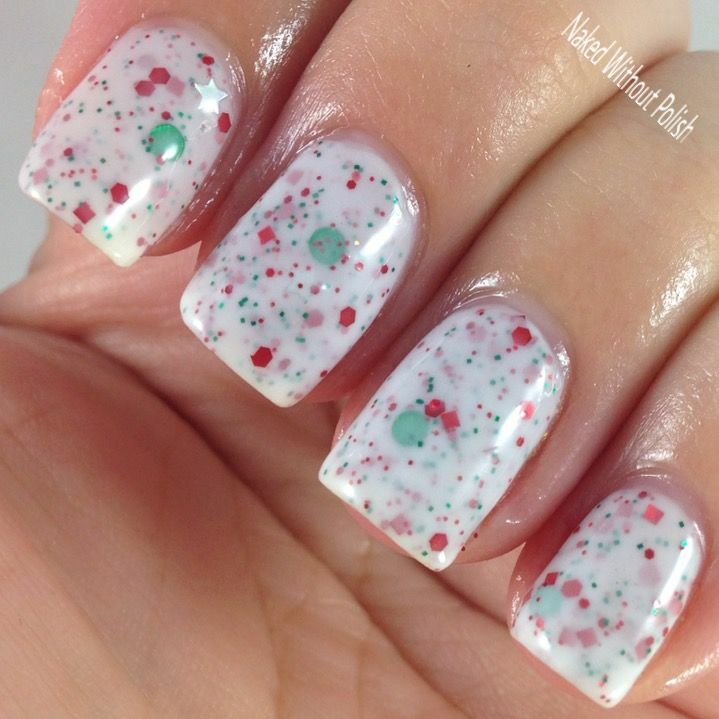 Jenn had her fans post with what their dream holiday polish would look like. Then she randomly selected 6 of the ladies and created each of their dream holiday polish to get this wonderful collection. Honestly, I'm kind of shocked how incredibly cohesive it ended up being. 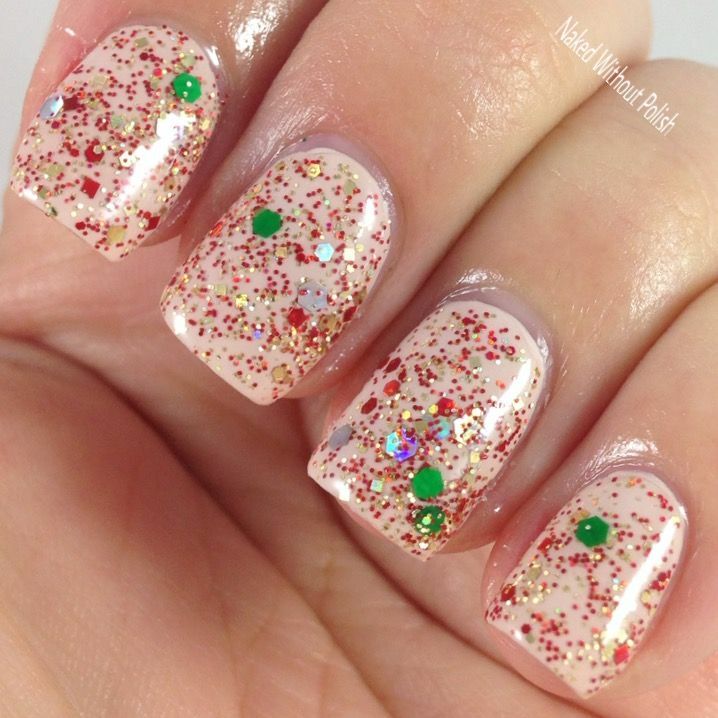 Eggnog Tipsy Santa, created with Jessica, is described as "a white crelly with holo green and red glitters in different shapes and sizes". Shown is three thin coats of Eggnog Tipsy Santa with top coat. Eggnog Tipsy Santa is a must have for any fan of white crellies. It is simply lovely! I didn't have to fish for anything, application was beautiful, and it was an all around joy to work with. 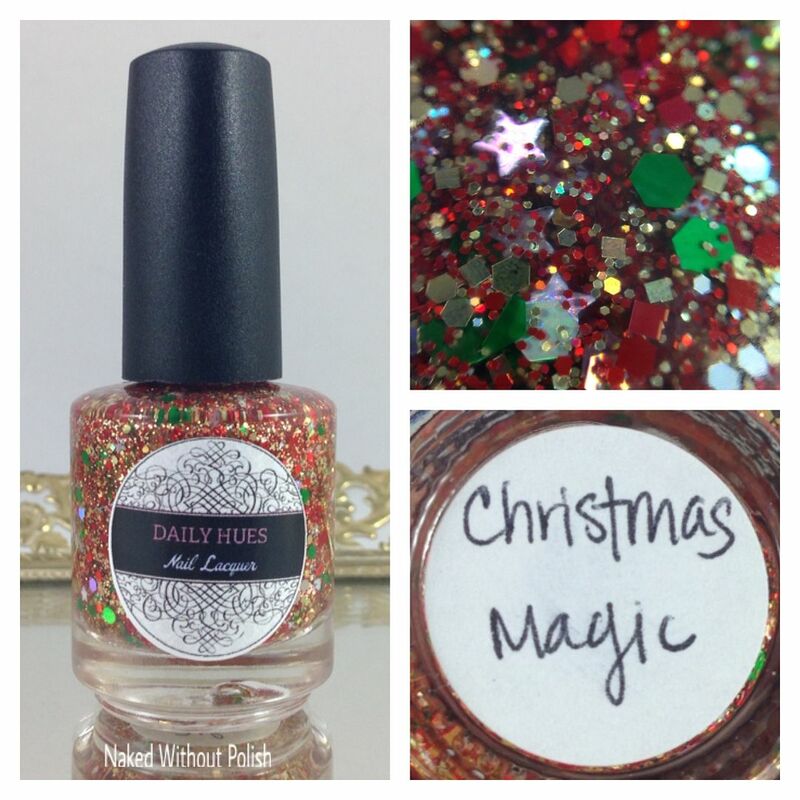 Christmas Magic, designed by Allison, is described as "a jam packed glitter bomb that includes silver, gold, green, and red, holo glitters in stars, hex, and circles". 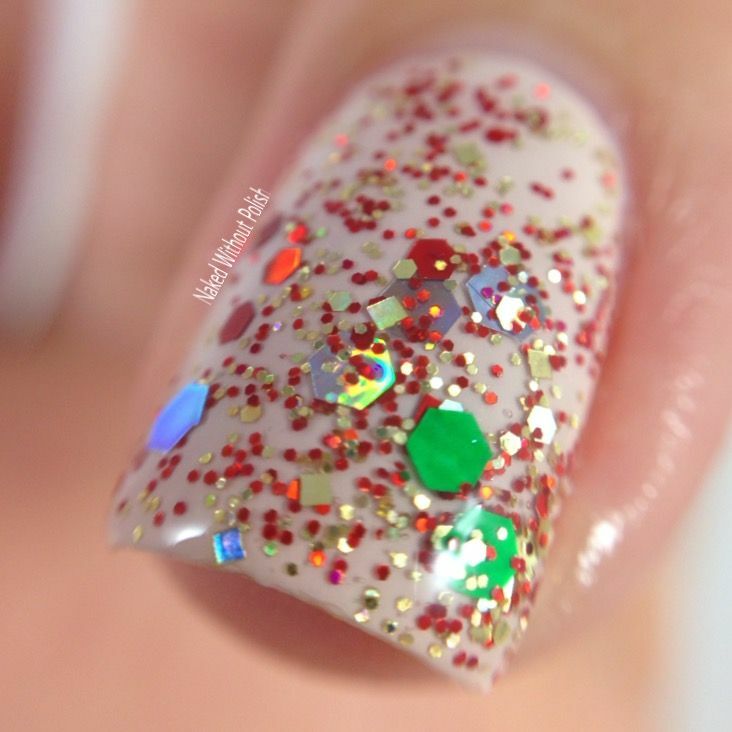 Shown is one coat of Christmas Magic over Barely Britches with top coat. Christmas Magic is crazy good! 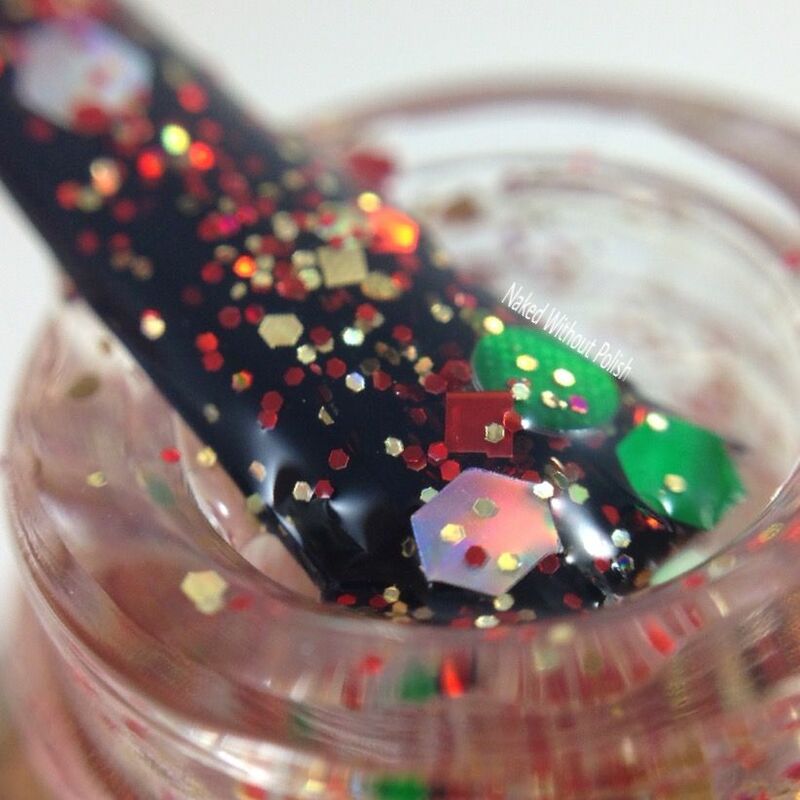 I love a good glitter topper, and this one is practically the ultimate holiday topper. 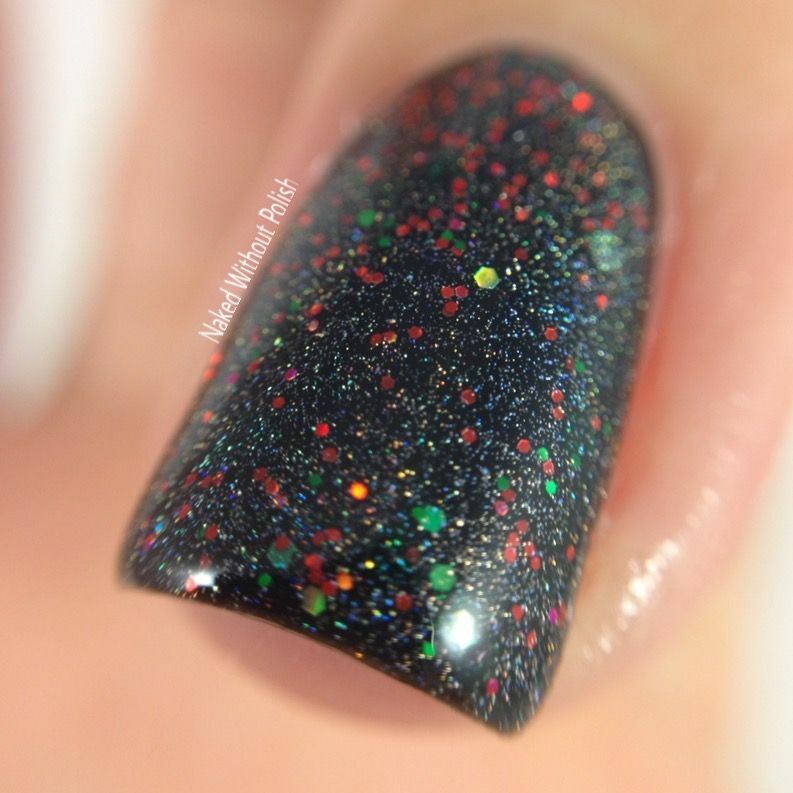 The colors are festive, and it's so packed with glitter a few coats would probably be opaque if you wanted, but one coat covers beautifully. 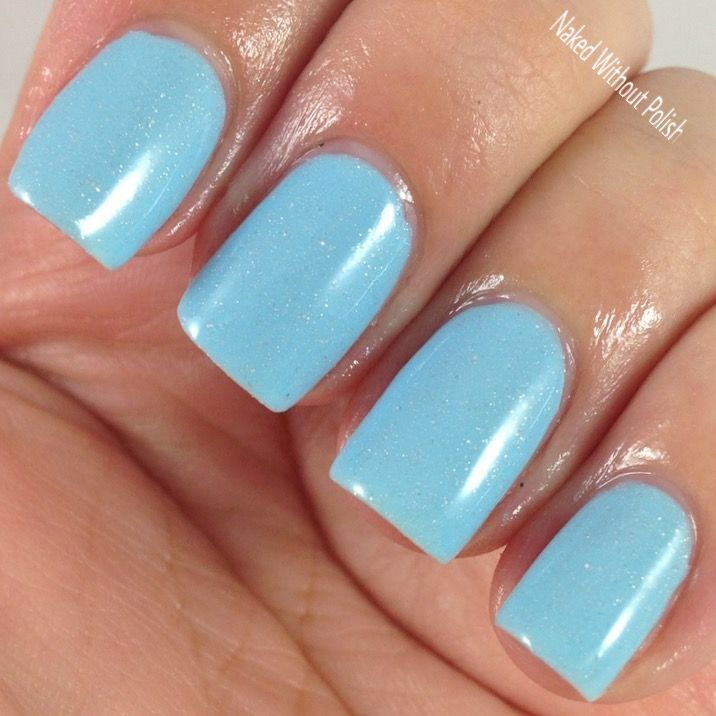 Ice Ice Baby, designed by Tammy, is described as "a light sky blue crelly with silver and holo silver micro glitter ". 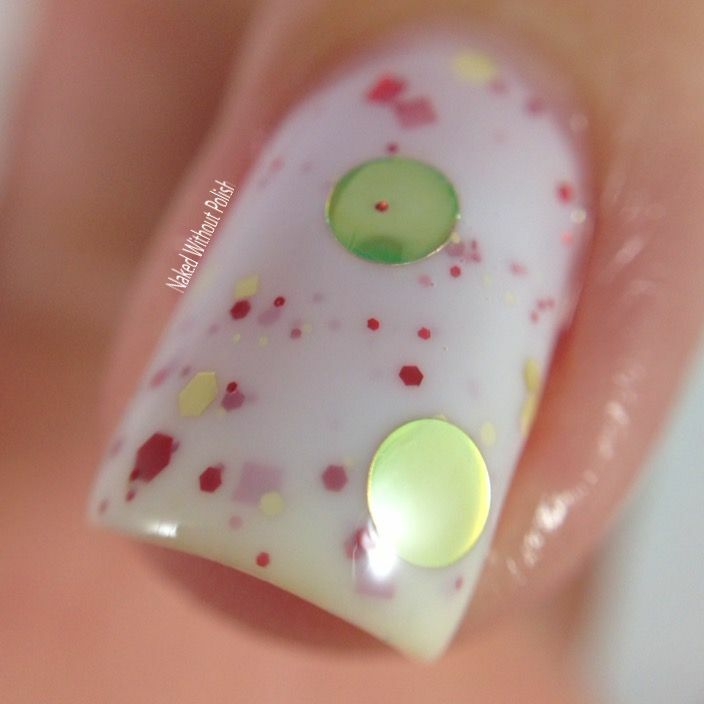 Shown is two coats of Ice Ice Baby with top coat. 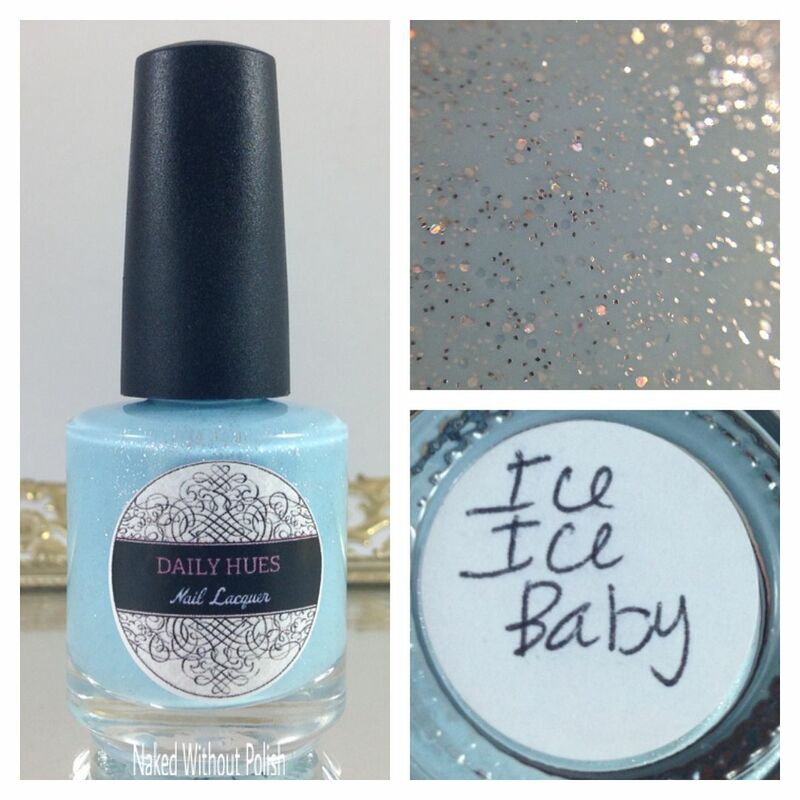 Ice Ice Baby is pretty, freaking, perfect! 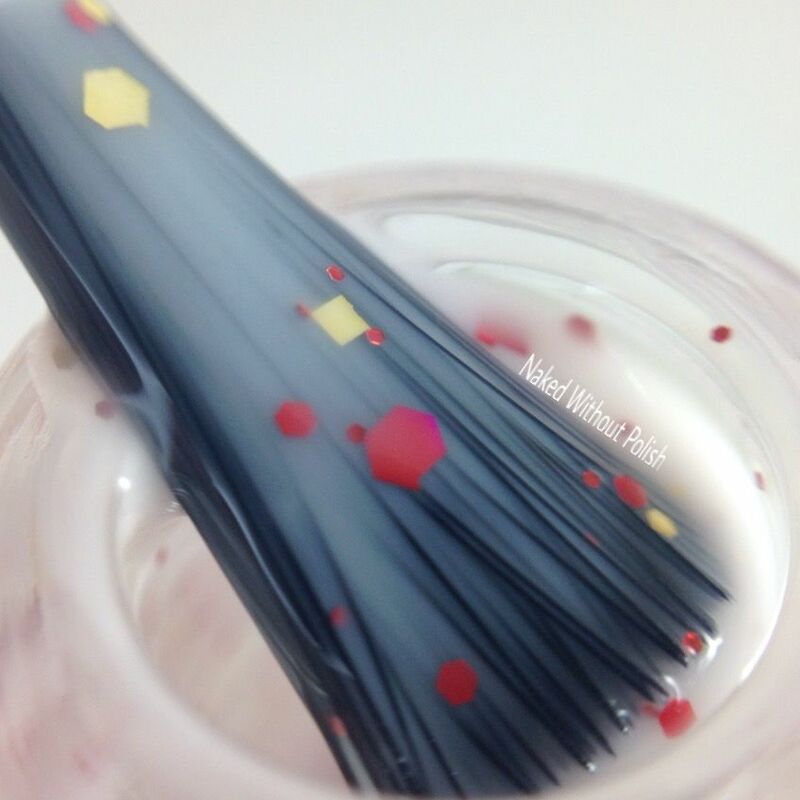 It's got a lovely application for a crelly and the color is just beautiful! I put this beauty on and was speechless. 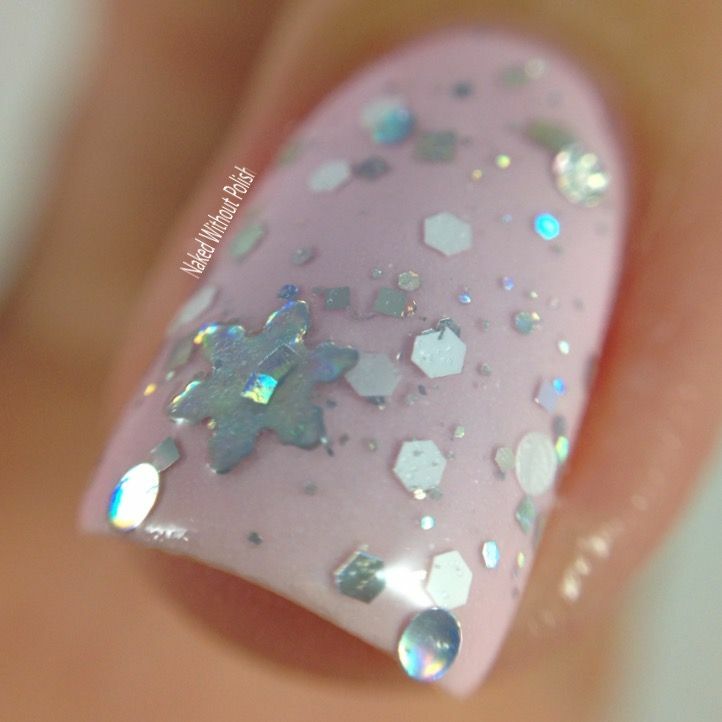 The First Snowfall, designed by Ana, is described as "a glitter bomb full of silver holo squares and hexes, matte white hex, and silver holo snowflakes". 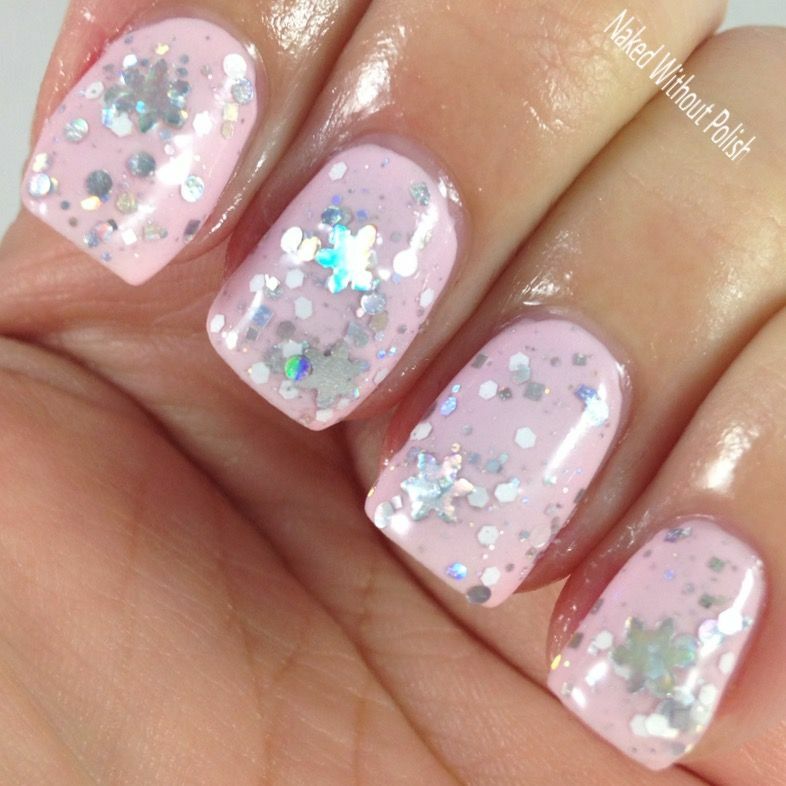 Shown is one coat of The First Snowfall over Pink Bloomers with top coat. The First Snowfall was one that surprised me. 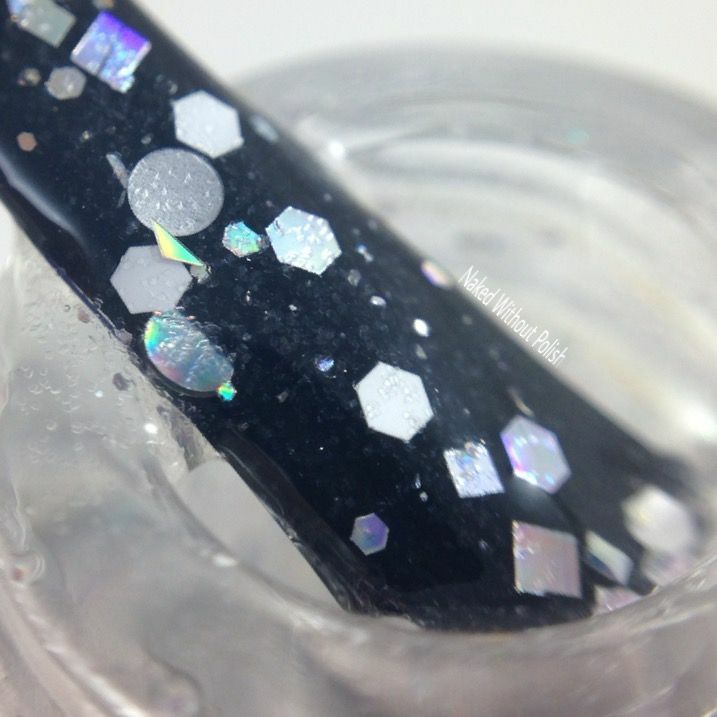 Silver holo with snowflakes? Been done. But wait, this is something different. The First Snowfall ended up being very dainty and soft. I did have to fish out the snowflake glitter with a toothpick, but that really wasn't all that bad. Don't let it deter you from this beauty. 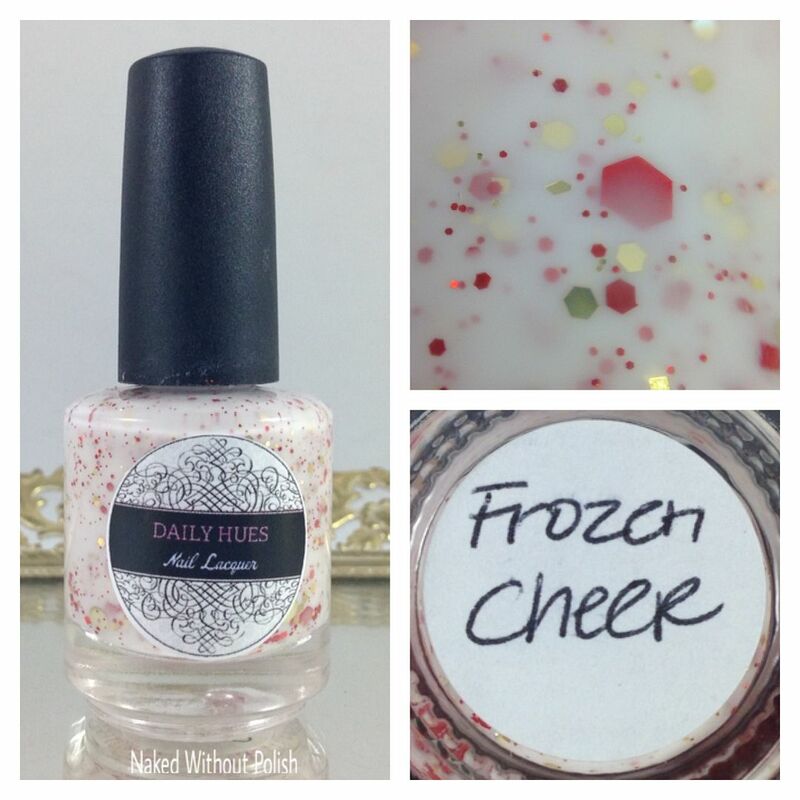 Frozen Cheer, designed by Mimi, is described as "a white crelly with holo red hex and micro glitter with larger matte red hex, large gold holo circles, and gold holo hex". 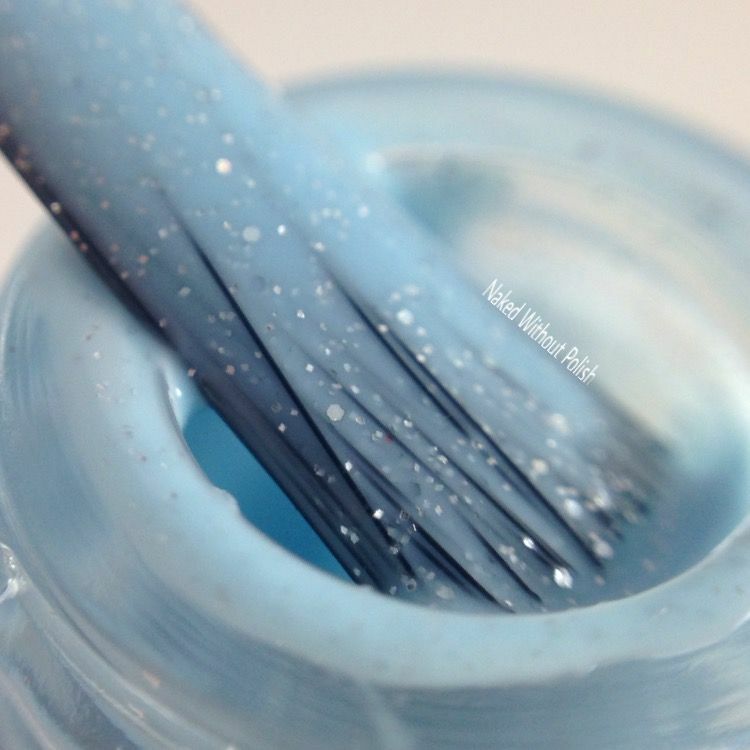 Shown is two coats of Frozen Cheer with top coat. Frozen Cheer is just as fantastic as Eggnog Tipsy Santa! You have to like larger glitter to really appreciate Frozen Cheer. Normally, I don't, but Frozen Cheer made it seem not so annoying. 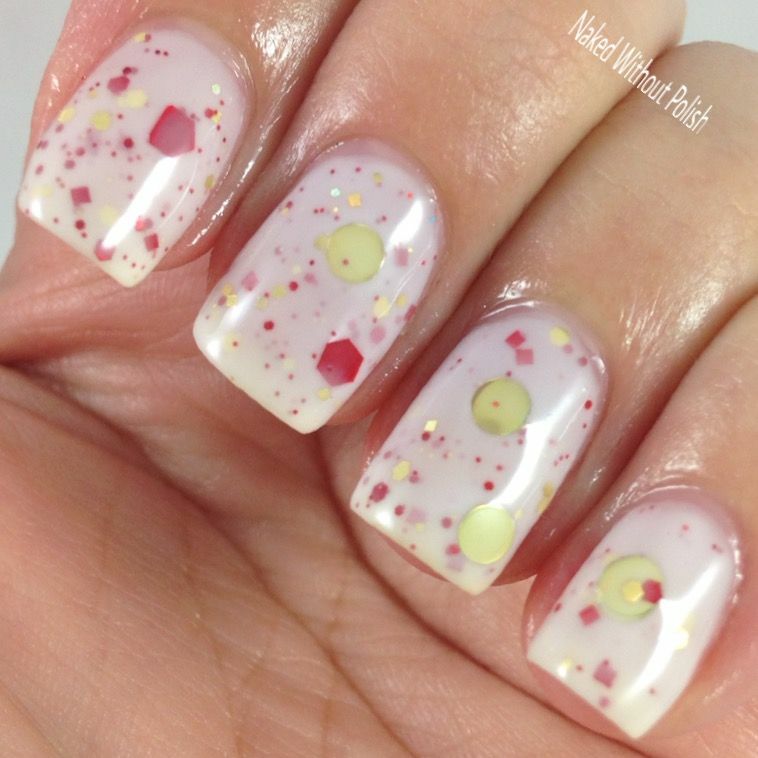 Application was perfection and there wasn't any fishing for glitter. 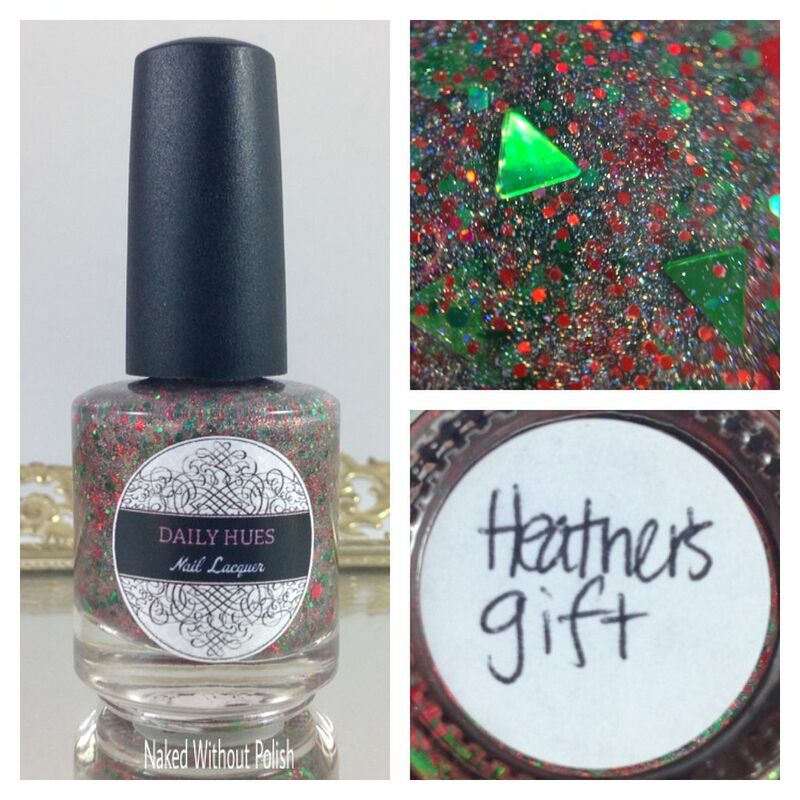 Heather's Gift, designed by Heather, is described as "a linear holo base with green and red holo micro hex, and metallic green triangles". Shown is one coat of Heather's Gift over Lace Thong with top coat. Heather's Gift was one I knew I would love. 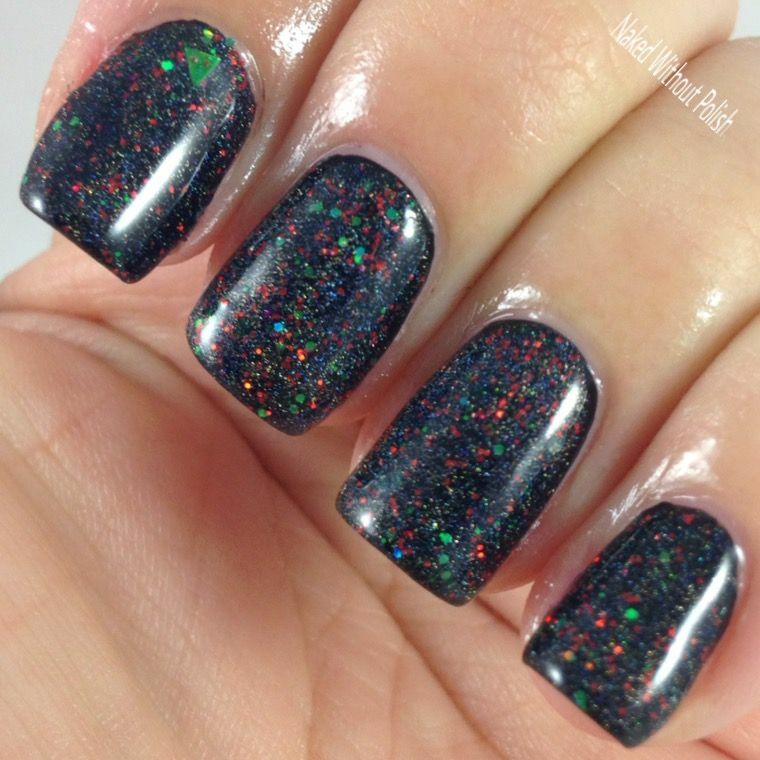 I'm drawn toward black based polishes with similar style glitters, it was a no brainer for me. 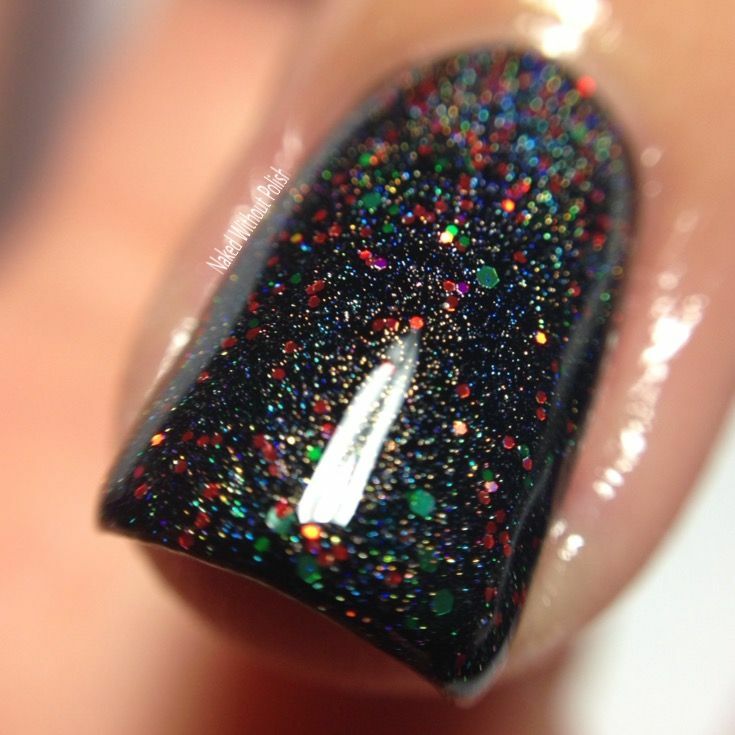 This polish was spot on perfection, with the one exception being I had a hell of a time trying to get the triangles out. In the end, I was only able to get one out. I should have had the bottle hanging out upside down for a bit. That usually helps me. However, I was out of it and just wasn't thinking. 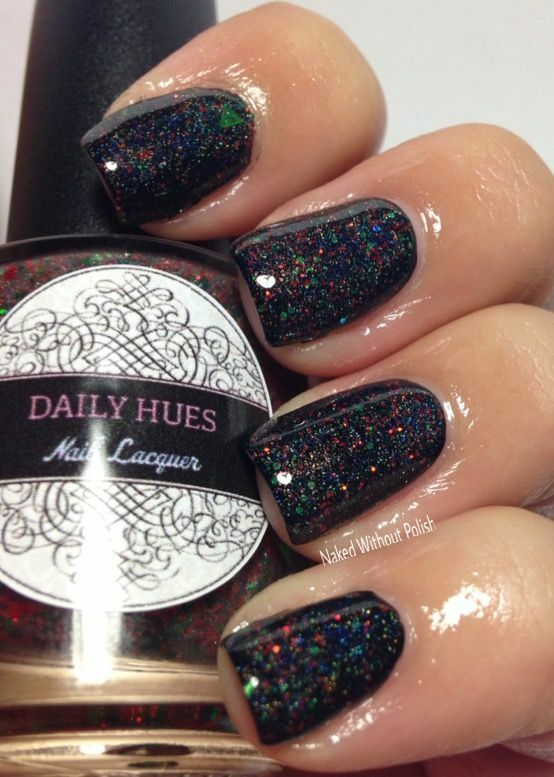 Daily Hues Nail Lacquer's Create Christmas Collection will be released today, December 2nd at 9 am PST. The polishes will be available for $8 - $9.50. 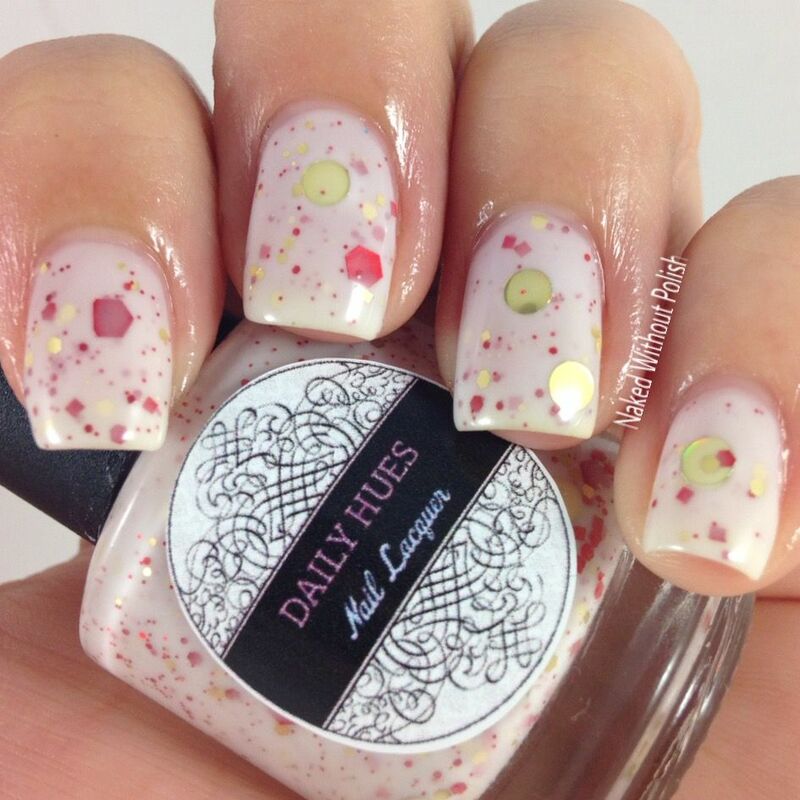 This group of polishes is absolutely lovely. I love that Jenn made these to celebrate her fans and customers. It was a kind thought and gesture. NOW, for the big news! How about a giveaway? How about 25 giveaways? Yes, I said 25. Let's think of it like an advent calendar of giveaways. We will have a different giveaway each day. Each giveaway will be open from 12 am EST and will run for 24 hours until 11:59 pm EST. All giveaways will be entered via Rafflecopter here on my blog. Each day the rafflecopter will be at the bottom of the daily posts (yes, I'll be posting every day...including weekends...for this giveaway). Each giveaway will have different rules. Some giveaways are international, some will require international entrants to pay shipping if they win, and some are US only. Please pay attention. All the prizes (except the one I purchased) were generously donated by each brand, and will be sent to the winners by each maker. Let's have fun! I'm hoping this is received well and can become an annual thing. If you have any questions, please email me at nakedwithoutpolish@gmail.com. 1. All entrants must be 18 years of age or older. 2. You must be a resident of the United States or agree to pay for shipping. 2. No giveaway accounts. You will be disqualified. 3. Giveaway will run from 12 am EST on 12/2/2015 through 11:59 pm EST on 12/2/2015. 4. There will be 1 winner. That winner will be notified via email provided in the first entry. The winner will have 48 hours after being notified to claim the prize. If the prize isn't claimed within 48 hours, another winner will be chosen. 5. Fraudulent entries will be disqualified. 5. Prize will be mailed directly from the provider within 1 week after prize is claimed. 6. This giveaway is not affiliated with any social media platform. 7. The prize was donated by the manufacturer. 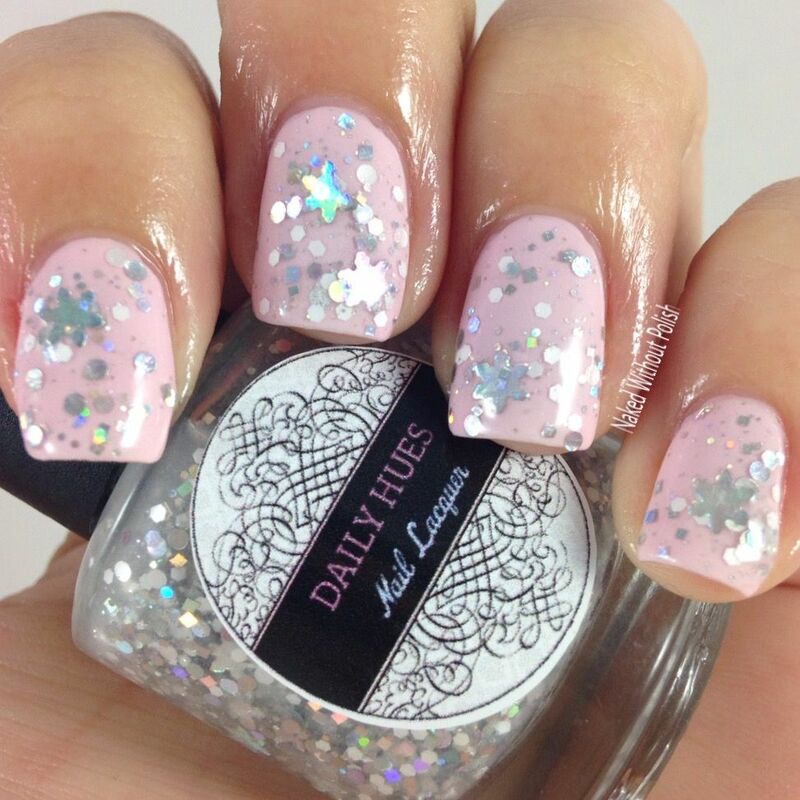 A bottle of Daily Hues Nail Lacquer Celeste and Fleur Di Lis.